Capitalists everywhere rejoice—a new study published in the Proceedings of The Royal Society B has found that individualism and fussiness pay off in the ant world. The study, published Wednesday, examined how rock ants choose new homes after their nests get destroyed. According to New Scientist, researchers found that “some ants are so different in their personal preferences that they may act as the imagination of the colony, driving it on to a better future.” Remind you of any of the great tech gods—the billionaires who brighten our planet with their innovative minds? Thought it would. Thomas O’Shea-Wheller, the study’s lead author and a researcher at the Ant Lab of the University of Bristol, told New Scientist that while ants don’t quite have personalities, but “there is variance in the way they make a decision.” The study followed 160 individual ants, and examined how the individual behavior affected overall nest quality. When ants are looking for a new nest, ants stop by potential new spots and lie down so other ants can detect their pheromones. The picky ants, the ones that are never quite satisfied with their current nest, can end up bettering ant society. When the ants only have low quality nests to choose from, “heterogeneity allows them to make a decision if many ants are picky. Heterogeneity is really the key to their flexibility – this is the first evidence of that,” Dr. Nathalie Stroeymeyt, a researcher at the University of Lausanne in Switzerland, said. The study suggested that an ant’s individualistic thirst for something better benefited the whole colony. “The ability of the colony to find new nest sites depends on there being some wanting to search. 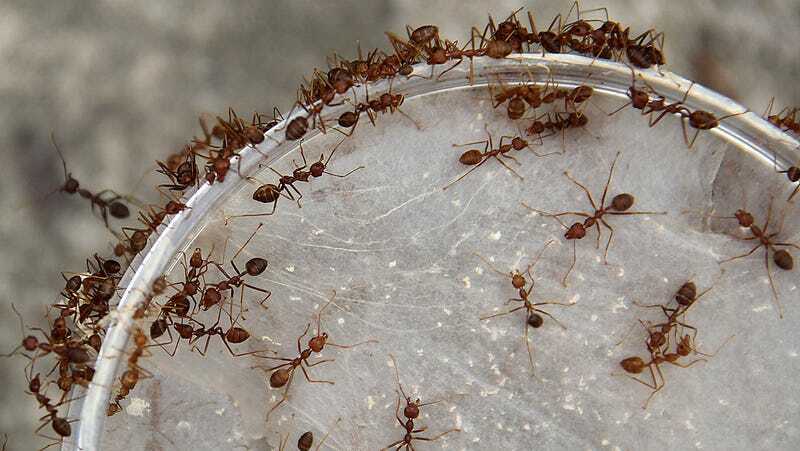 It’s useful to the colony to have some ants that are fussy,” explained Dr. Anna Dornhaus, who studies social insect at the University of Arizona. You might want to make some radical conclusion that this study proves capitalism is actually beneficial to the working man. I prefer to find another sort of meaning buried within—depressed loner weirdos are good for society. Either way, if you’re an ant, it pays to be uppity and reclusive.